Agromyza nigrociliata Hendel, 1931; Spencer, 1976. Fauna ent. Scand. 5(1): 129-130, figs 224-5. Agromyza nigrociliata Hendel, 1931; Spencer, 1990. Host specialization in the world Agromyzidae (Diptera) : 356, 359, 360 (fig. 1345). Leaf-mine: The young larva first feeds towards the apex of the leaf, later turning and feeding downwards. Several larvae can occur together in a single leaf. Pupation external (Spencer, 1976: 130). The larva is described by de Meijere (1925), Hering (1953), Darvas and Papp (1985) and Darvas, Skuhravá and Andersen (2000). 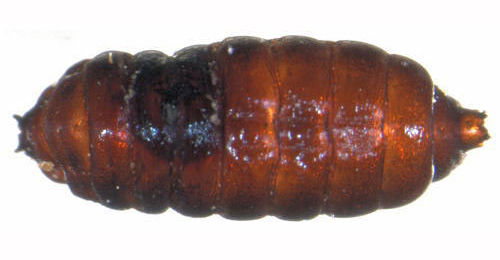 Reddish-brown; posterior spiracles each with 3 bulbs (Spencer, 1976: 130). The puparium is illustrated in Bladmineerders van Europa. Comments: A potentially serious pest on cereals. Time of year - mines: June (Bladmineerders van Europa). Time of year - adults: June-July. Distribution in Great Britain and Ireland: Widespread in Britain including London (Hampstead), Surrey (Colley Hill, Epsom and Kew), Cornwall (Carbis Bay) (Spencer, 1972: 33), Midlothian (Morningside and Braiud Burn), Fife (Aberdour), Haddington (Aberlady), Dunbartonshire (Bonhill) (Bland, 1994c: 81), Warwickshire (Hartshill) (Robbins, 1991: 136), Cambridgeshire, Easterness, Elgin, Glamorgan, North Somerset, Nottinghamshire, Oxfordshire, South-west Yorkshire, Surrey, West Norfolk and West Sussex (NBN Atlas). Distribution elsewhere: Widespread in continental Europe including Denmark and Sweden (Spencer, 1976: 130), Belgium (Bladmineerders van Europa), Germany (Spencer, 1976: 546), Austria, Belarus, Czech Republic, Estonia, French mainland, Hungary, Lithuania, Poland, Slovakia, Spanish mainland and Switzerland (Martinez in Fauna Europaea). Also recorded in the East Palaearctic (Martinez in Fauna Europaea).